Anna is one of seventeen small dogs rescued Nov. 21st by Friends For Life. Anna is a sweet female who is four years old and is friendly and sweet. They were all living in small quarters in WV and getting along great with each other, also with a golden retriever. Their owner was taken to the hospital and passed away. They were rescued and were living in a humane society with limited space so we just took in six of them, much thanks to Pilots 'n Paws for flying them in. They are all sweet dogs, small and friendly. They will be available after 12/6/09. The males will be neutered prior to adoption. The females are already spayed. These are really nice dogs who would be great for an apartment, condo, or home. They all will make nice companions for anyone and could live in multiple dog households and with cats. 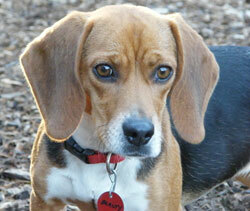 Beauty is a tiny 1.5 year old Beagle mix who hails from Indiana. She is adorable and playful and everything you'd want in a beagle. She's even quiet. She plays nice with other dogs and is very submissive. She would probably be fine with cats, but might want to play. What a nice dog. She is available after 12/6/09. She is reputed to be the most gorgeous and sweet beagle girl in the world! Speed the process by filling out an application on our Apply To Adopt link on our web site. She will be at the meet and greets this weekend! Meet Cazu, a friendly Aussie boy who is about two years old. His original owner said he traveled too much and couldn't keep him. He is medium size, housebroken, good with kids and would be great in a family. He will tire out other dogs with his playfulness so might be good for dog parks but not for living with other dogs. He hates being in the kennel and is hoarse from barking, but he is the perfect angel in the house and doesn't make a peep. He will quietly amuse himself chewing on a bone or playing with a soft toy. He likes to cary around a stuffed animal in his mouth. At the shelter where he was turned in he was absolutely the SWEETEST temperament and passed all the temperament tests with flying colors . He has a naturally bobbed tail, which makes us think more Australian Shepherd. He has a gorgeous coat and is such a friendly boy. 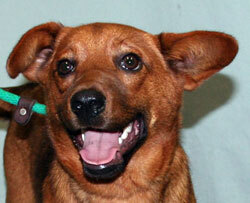 He is Available NOW and we would love to see him go home soon as he is so happy just hanging out on the couch. He is just a great dog. If you are interested in adopting Cazu, please fill out an application on our web site and that will help us to speed the process. Our hours are posted on the home page. Delta is a darling 3 year old Lab mix who originally came from Indiana where she was in a foster home and very bonded with her foster mom, who is a retiree. She is a gentle dog who would thrive in a quiet household. She is good with cats and will co-exist with other dogs, but is shy at first introductions. She is best if she is not with a dog who would jump all over her and would be best in a home without children or with just visiting children as she was not raised with kids that we know of. She was a stray who came into a rural shelter pregnant and raised her pups and saw them off to their permanent homes so now she is looking for a home of her own. 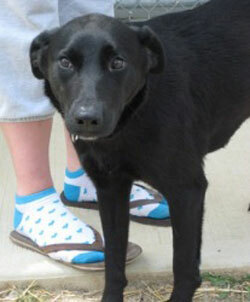 She is a very special dog who needs a sensitive and loving adopter. We prefer a stay-at-home, retiree, or someone who just works part time as she is used to having people around. She is house trained, leash trained, will ride nicely in the car, and according to her foster mom "is the most loving dog you will ever meet". To speed the process, fill out an application. 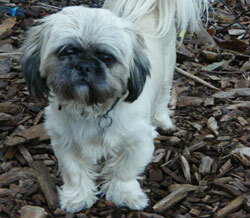 DJ is a fifteen month old Peke-Shih Tzu male who was given up because of family health issues. 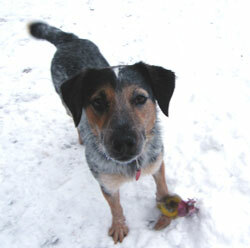 He is great with other dogs, raised with cats and socialized with older children. He weighs 12.6 lbs. 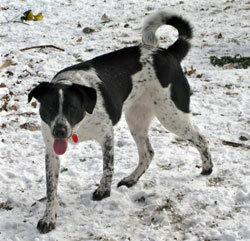 Fox is an 8 month old pup who is full of fun and play. He is a mix of many breeds, which is the best kind of dog to have. He has a soft, luxurious coat that keeps him warm. He loves the snow! 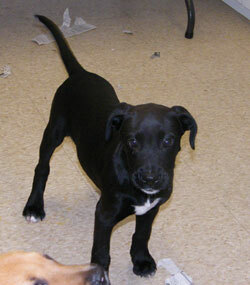 He is smart, joyful, and adorable and waiting to join your family. He would be a great dog for teens or someone who wants to throw a ball for him; also he would be great as a second dog for another dog who loves to play. Fox just thrives on playing. He would be a great doggy daycare dog as well. He is available now and can be seen at the shelter on visiting days (weekends 12-3 PM) or by private appointment on week days. To speed the process, fill out an application and we'll have it on hand when you come to one of our Meet and Greet events. 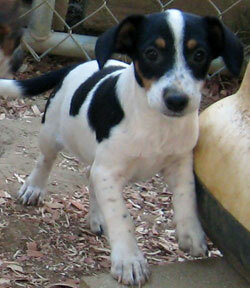 Iris and Lilly are five month old female Rat Terrier mix puppies who weigh 10-12 lbs each. They were brought to a dog rescuer's home in TN and she was full so the owner asked where the nearest Animal Control place was because "they were leaving today", so the rescuer took them in to keep them from being put to sleep. They are shy upon introductions, but happy and playful in their foster home in Western MA. They loving chasing balls or playing tug-o-war. They are great in the car, not leash trained though, would be great with someone who can spend the time with them. Each will get adopted separately, of course. Iris is more outgoing, but Lilly is more of a cuddler. Our process is that you fill out the application first, then give us a few days to get back to you. Please read our guidelines under Apply to Adopt as some dogs require a stay-at-home and some dogs require a fenced in yard. 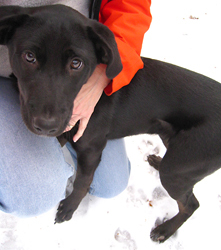 Jeff is a 7 month old neutered black Lab mix pup who needs a good home. He was picked up as a stray running at large in a rural town in Indiana. He is playful and friendly. He will be available on 12/6/09. Speed the process by filling out an application in advance, then come to a meet and greet and we will print out your application. 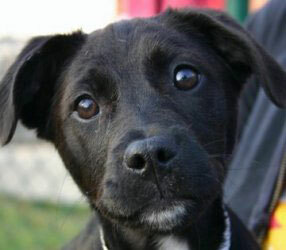 Mackenzie is a 4.5 month old spayed Lab mix pup whose mother was hit by a car. Her owner kept her for awhile, but did not feel they had the time for her. She understands commands in Korean. She is available NOW. What a nice puppy. We can't believe we still have her. To speed the process, fill out your application to express your interest and then come to one of our Meet and Greet events. Hours on our web site. Maggie is a sweet 12 week old female pup who was homeless in Mississippi and brought to New England for a chance at life. She is large boned and solid so will be a nice size. She has a great personality and is as curious and playful as can be. She is available now, but we didn't want holiday puppies so will be available after Christmas. You can apply on our web site if you're interested in adopting her. 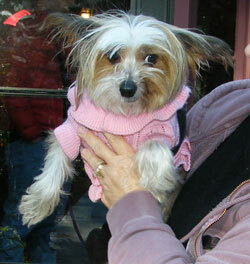 Maggie Mae is a 5-6 year old hairless Chinese Crested who was relinquished locally. She will be spayed and have a dental cleaning before she is adopted. She is in a foster home and can be seen by private appointment. Maggie Mae is a real lap dog as she just wants to sit in your lap. She does not care about toys or other dogs, although she can co-exist with them as well as cats, but she really wants her own person. If you want a little lap dog, she's your girl. She will be at the meet and greet on Saturday! 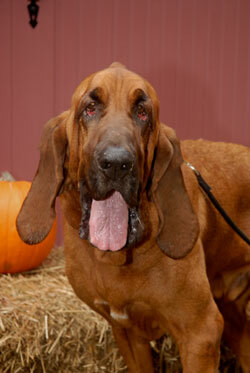 Mugsy is a very sweet 5 year-old neutered male purebred bloodhound who was surrendered due to his owner's illness. He gets along well and is patient with children and other dogs, although due to his size he probably should not be in a home with very small children. He is wonderful with cats, even sleeps with them. He is great with small dogs even lets a puppy jump all over him, but is afraid of bigger dogs. He weighs 118 lbs. and is a gentle giant. He is not a barker but will bay when strangers come near the house. He enjoys long walks, scratching behind his ears, snacks, and relaxing with his family. He likes to hang out and his favorite spot is on the couch. He is currently undergoing chiropractic therapy on his back. We had him examined by an ortho specialist and he does not have hip dysplasia, but more of a lumbar sacral issue for which we are treating homeopathically. He also has the entropian eyelashes and although we had him worked up with a surgeon, he is not scheduled for surgery as we feel it is too high risk for him at this point and also because he is doing so well on the eye drops. His eyes look great and do not seem to bother him as they were when we first took him in. Mugsy is a great dog who needs a loving adopter. He is fine if you work full time and does not get into your stuff and he can hold it until you get home. He is in a foster home, so please fill out an application to be considered for an introduction. Donations toward his medical bills are gladly accepted. 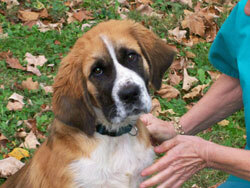 Paris is one year old spayed St Bernard/Dalmation mix who recently lost her home due to foreclosure. 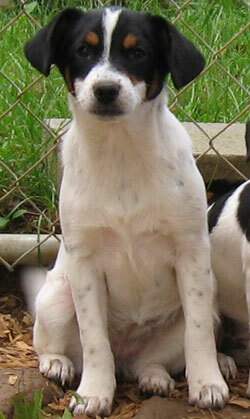 Her mother is a purebred Saint (we have pictures) and dad was a purebred Dalmation according to a DNA test. Paris is used to living with large dogs and so is used to playing rough. She is not the least bit aggressive, however. She has always lived with a Saint so would love a Saint friend or large breed friend . She can be timid and nervous in new situations, but is totally affectionate and warms up quickly. She may not present her true personality when you first meet her, but don't worry. You won't be disappointed. She was raised with cats and was great with them. She's a sweet dog who is deserving of a good home. Her foster mom writes: Paris is a whole new dog outside of the kennel! She is sooo affectionate, can’t get enough of people – this girl is starved for attention. I haven’t seen her with kids, but she is so gentle that she would likely do well with them. Paris and my 7 month old pup played all day long; he’s quite a bit bigger than she is, but that doesn’t bother her in the least. No problem getting along with my much larger male either. She is a bit cautious with the cats so far, but will make friends with them in time. She looks like a sporting breed, but doesn’t have the high energy of one. Rides well in the car, walks nicely on a leash and is quiet in the house. This girl is ready for a home! Please fill out an application and we will arrange for you to meet her. To speed the process, fill out an application so we'll have it ready when you come to meet her. Our hours are listed on the Web site. 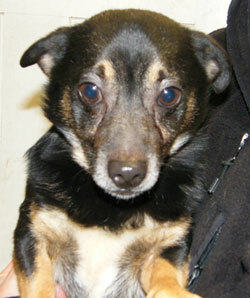 Rocky is an adorable small dog who is very friendly and affectionate. He weighs about 14 lbs and is a cuddle bunny! He is one of seventeen small dogs rescued Nov. 21st by Friends For Life. They were all living in small quarters and getting along great with each other, also with a golden retriever. Their owner was taken to the hospital and passed away. They were rescued in WV and are living in a humane society with limited space so we just took in six of them, much thanks to Pilots 'n Paws for flying them in. They are all sweet dogs, small and friendly. They will be available after 12/6/09. The males will be neutered prior to adoption. The females are already spayed. These are really nice dogs who would be great for an apartment, condo, or home. They all will make nice companions for anyone and could live in multiple dog households and with cats. 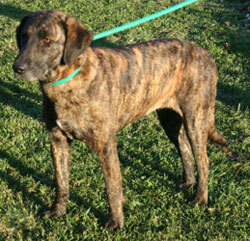 Sara Bell is a gorgeous brindle Plott hound who is 3 years old. She is a very sweet-natured girl who has a calm and loving personality. She enjoys attention and lots of petting! Sara Bell has lost her right eye, but has adapted well. She walks well on the leash and did fine on her behavior test. Sara Bell gets along well with other dogs. She is current on shots and is heartworm negative. This is a very wonderful, gentle dog! She is available 12/6/09. To speed the process, fill out an application on our web site and you might hear from us sooner. Sebastian is a 5 month old Saint Bernard mix pup. He has extra long ears so is not purebred.He is in a foster home and thriving. Sebastian loves long hikes in the woods, to explore all the scents and frolic. 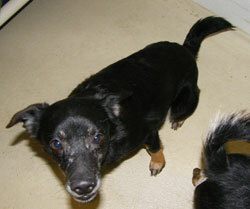 He is good on a leash and enjoys a big comfortable dog bed and snuggling with his foster family. He will be a great companion to a famliy with large breed experience! If you have children in your family, because of his size, teens and above only please. Everyone we meet on walks giggles because he is so cute and friendly. He has a delightful personality! No phone calls please. The best thing to do is fill out an application, which is at no cost to you. We are looking for large breed experience with this pup and older children so that he does not grow up to dominate. Apply to Adopt is the link to click on. Sebastian will be at Saturday's meet and greet only! 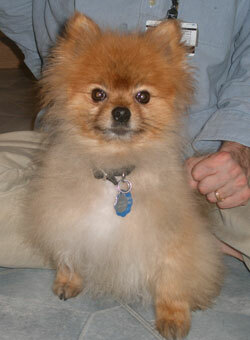 Shrek is an adorable little five year old Pom who needs a new home. He was given to relatives who work full time and he is very lonely during the day and barks to express his anxiety. He would love to be your little lap dog. He would do best in an adult-only home as he was not raised with children. He is a cute little guy, tiny and like a little wind-up toy. He will make someone a wonderful dog but will need a little training and patience. He is puppy pad trained. He will be at our Meet and Greet on 12/6 from Noon to 3 PM. To speed the process, please fill out an application on our web site. 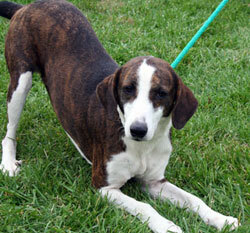 Sissy is a beautiful brindle and white Plott hound/boxer mix who is 2 years old. She is in a foster home now and her foster mom says, "Sissy is great with kids, great in the house and housetrained. She is good in a crate at night (sleeps without a sound for 9 hours) and LOVES to go on walks. She is an absolute gem of a dog! She has a wonderful personality--loving and playful! Sissy loves being around people and getting lots of snuggles." Sissy gets along well with other dogs. She has had her initial immunizations and is heartworm negative. This gorgeous girl would love to share a romp outside with you! She is available now. To speed the process, fill out an application on our web site. 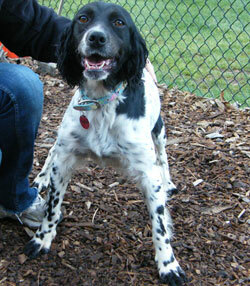 Tasha is a lovely medium sized Springer Spaniel who came to us after being rescued. Her birthday is 10/23/06 so she is just 3 years old. She is a darling dog and is active outside, but will calm right down when she is petted. You won't find a more gorgeous dog than this one. She was perfect in the bath and stood like a show dog the whole time. She is not an outside dog that you leave in the yard unattended as she can climb a chain link, although she never tried it year. Her foster mom says: "Tasha is awesome! She is so happy go lucky and loves everyone – adults, kids, cats & my dog! She plays so nicely, no aggression with the cats, and goes to the door to go out. She has been on the kids laps all afternoon & evening. Very sweet and gentle. Her favorite stance seems to be standing on her hind end with her paws on your belly. She stays like that and looks at you like she’s smiling! She made herself part of the family as soon as she stepped foot in the house. She is just phenomenal with the kids! She adores them and just wants to cuddle up and snuggle." She is available, but because she is in a foster home, we will bring her here on certain days to show. To speed the process, fill out an application on our web site under Apply to Adopt. 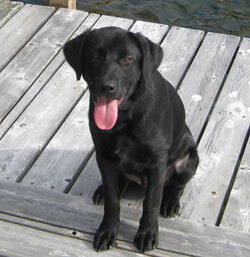 Teddy is a gorgeous 8 month old Lab who was the love of someone's life until allergies in the family caused his return. As you can see, he loves water and has had lots of outings near and in water. He is great with dogs, cats, and kids. Available by private appointment as he is currently with his owner until a foster home opens up. 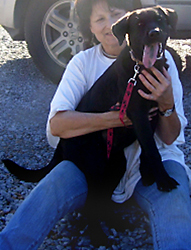 Tellulah is a young female lab puppy who was a stray in MS. After 2 or 3 straight days of raining, someone called and reported her....she was found tied to a cinder block! Even though there was an old trampoline behind her, the nearest house said the dog did not belong to them. She's such a lovely dog, very labby, and very affectionate. She is available NOW. 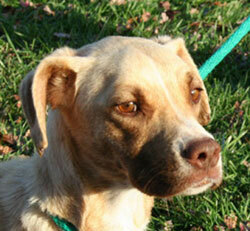 Vicki is a very sweet blonde lab/beagle/boxer mix who is 2 years old. She arrived at a rural shelter quite thin and it appeared that she has had a litter of pups. In spite of the tough time she had in her prior life, Vicki is quite loving and gentle and now that she's up in MA she's playing with other dogs, chasing balls and chewing on bones. She's had a bath and she was so excited she ran all over the yard showing off her shiney coat. She is in a foster home and is all play bows and kisses. She enjoys people and is good in her crate. We think she would be fine with cats as well. She has had her initial immunizations and is now spayed. Won't you please give this wonderful girl a chance at a happy life full of love? She is available to be seen after 12/6/09. To speed the process, you can fill out an application on our web site and let us know if you are interested in this beautiful little girl. 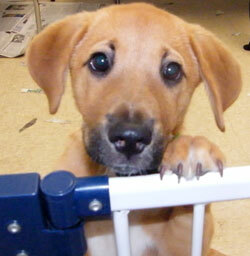 Wilmot is a little puppy who was homeless in Mississippi and brought to New England for a chance at life. He is a very affectionate pup who is also very smart. He will warm your heart and melt you with his puppy breath. He is available immediately. We held off putting him on the web site until now as we didn't want him to be a holiday puppy. We're hoping for a very committed adopter who will see him through his senior years. Please apply on our Web site to speed the process.